Great job! Aww, Mike looks so alone on the cover, heh. - I work for a company that puts content out on the web and, like Rifftrax, is probably concerned about piracy. I am also a filmmaker, and I have had the unpleasant experience of seeing my own work bootlegged by merchants when I myself was not able to make any money on my own film (it was a fanfilm). I have had to confiscate media from booths at conventions, and it's always a knockdown drag out fight because the merchants make up every excuse in the world ("I paid for the blank media and print cost.... I'm helping promote your film... it's not your copyright so you can't report me") and I don't always have proper documentation to legally prove it's my work. Even when I pop in the offending DVD and point at my face, it can be tiring. Also, the convention organizers don't want to scare away the merchants because they bring in a large amount of money, so they tend to side on the merchant when things are grey enough. In any case, here's the cover and here's also the link to the hi-res version for print and download. I think you've done a great job for the most part, I like that you've added in the review quotes, that's something fairly unique so far, but not all that keen on the whole blocking Liams face bit. Thanks. When working on the arrangement for the front cover, I went through every arrangement manageable... Mike on Obi-Wan and Kevin on Qui-Gon, then I tried the other way around, then started trying Mike on Anakin... the main problem was that Qui-Gon's face just did *not* play well with any of the headshots I had with either, plus the major pain it was to match the hair to either of the two. (Kevin came closer, but the texture of his hair didn't blend unless i recolored all of Qui-gon's hair to match). Finally, I just gave up on it and found both headshots that worked perfect for Kevin and Mike... Kevin's head on Obi-wan the way it is couldn't have been better, and who *wouldn't* scream in horror if they were Anakin? So finally, I had the three on their respective bodies, with just Qui-Gon just kinda sitting there, blank look on his face, and it didn't work. So, I did what I thought Liam Neeson would want me to do: remove any notion that he had anything to do with his stinkburger. Just a guess, but I am sure that this site has the least amount of "argh, pirate" types than most sites. I mean, if you are too lazy to buy a $5 dvd, something is wrong with you. I think it's more about laziness. As RiffTrax gains in popularity, I could easily see bootleg RiffTrax DVDs on sale at conventions, and we don't want any flak from that coming back to our friends at Legend. Exactly. I'm not worried at all about people on these boards, it's the people that see an opportunity to make a buck. I guess I should explain better, I used to work for Theforce.net and currently have a film hosted there. I have never been to a convention where one of the films they provided *wasn't* being sold. And frequently, the packaging would just be whatever graphics were on the website. So, I speak from prior experience that putting a DVD cover out is inviting someone less than ethical to slap it on their DVD box and make it look as official as possible. Technically, by providing the DVD cover art, I am probably violating copyright laws. This is a slipperly slop kind of arguement. 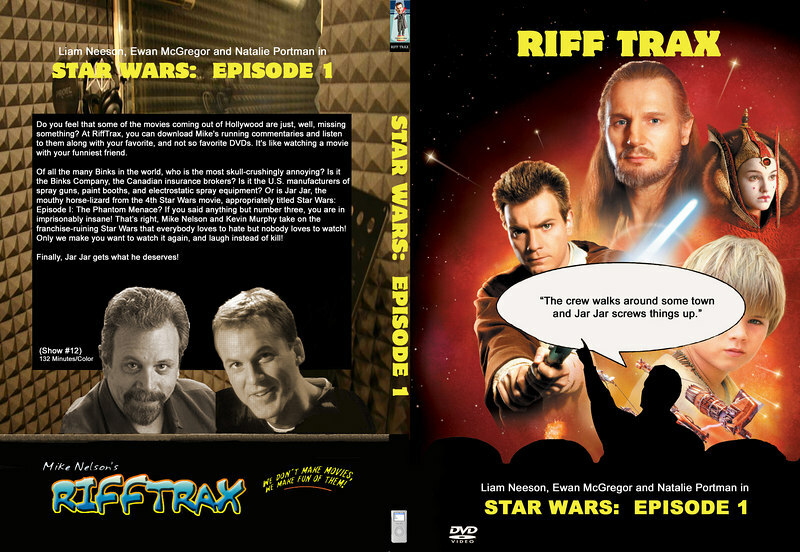 Even if hte ENTIRE purpose of me providing the art is to get folks to buy the DVDs to go along with the rifftrax. After all that is said and done, the judge declares fair use or not. Given the circumstances of why and how you made that DVD cover, Lucasfilm could easily tell you to stop by sending a Cease & Desist, but they would probably not have a case for seeking restitution or other punishment. One positive note i can pass on though is that Lucasfilm is extremely positive about fan works and the odds of you ever hearing from them over a DVD cover is extremely low. There are more things in heaven and earth, Horatio. Well I for one feel a lot better about the covers I'm making knowing Chris Hanel is paid to do this kinda stuff. Awesome man. I'm doing the best I can on Photoshop LE with absolutely no training whatsoever. Did you get to look over the LOTR competition stuff? And in return, the show references Star Wars lovingly, rather than in mean-spirited parody. No, not yet. I've had a couple people tell me about the fan art contests and it just makes me wish I'd been around earlier. <B>Raven</B>: Don't sweat it. I got started in Photoshop back in 1998 when the computer lab supervisor showed it to me and i've been self taught ever since. The first time i got an actual class on anything was a month ago for school. It's like anything else... keep working at it and be open to learning all the time, and you'll see your work steadily improve.